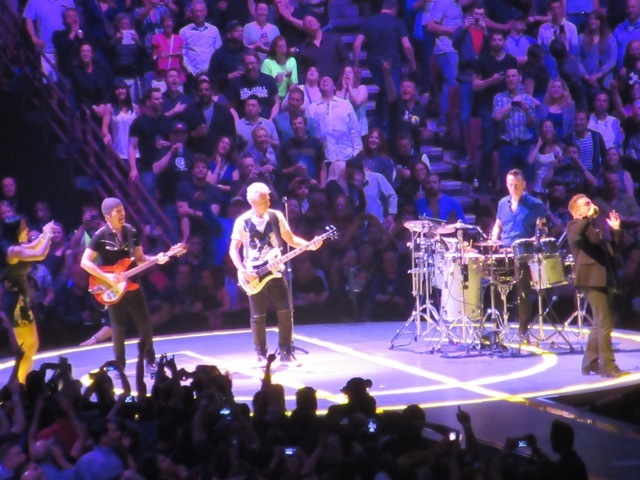 Eoghan McDermott of RTE's 2fm reporting from Vancouver on the opening night of #U2ieTour. Vancouver, Friday May 15th, Bono brings a girl onstage to operate the I-Phone, that broadcasts onto the main screen, while the band is performing "Angel of Harlem". Elation of finally seeing u2 again in BC for both shows (=29th show?) Now mixed with desperation of where to see them next... I shall not wait until the next month, or year to cross my fingers for the next spin off the wheel. U2 fever running wild again. No Dr. Needed, just another experience of my what reminds me of my innocence. U2 love is blind with perfect vision. U2+great music+ fans=a life changing moment. U2 delivered an amazing first concert of this tour. Glad to see that they are back with much joy and energy. With its raw guitar riffs, "The Miracle" was a great opening track and early songs like "Out Of Control" continued to generate the power of a real rock show. Singing a snippet of "Mofo", Bono created one of the most touching moments as he dedicated "Iris" to his mother. Musically and visually, "Cedarwood Road" led the fans back to the early days and surroundings where Bono grew up. Another highlight full of passion and deep emotion. It was also fascinating to listen to "Bullet The Blue Sky", a classic that sounds as fresh, fierce ad intense as ever. 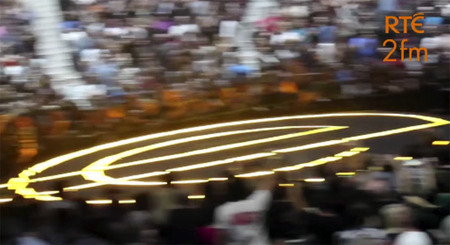 The stage beautifully symbolises the tour´s title and some stunning visuals support the effect of the music. Walkway and round stage enable the bandmembers to build up much proximity to each other and the audience once again. Congratulations, U2! Looking forward to seeing a show in Berlin! Saw both Vancouver shows, one GA, one seated. Fantastic, stunning, groundbreaking, heart pounding, body moving, breathless and speechless, don't even begin to explain these shows! That was only night 1 & 2!!!! I was worried coming in that some of the naysayers could be right in some way, the boys are getting older (as are we) and questioned if the heart and soul and energy would plY out on stage as other tours have. My answers came quickly as the Ramones songs began to play, and the lights went down. Soon after there they were, there we were and it was like pure adrenaline, energy, youth and more. I was also not sure how the new songs would play out on stage/live, but they absolutely gave the classics a run for their money!!! Haven't stopped singing since the final notes were played, and the last lyrics sung. All the travel, waiting in line, money spent, the terribly aching and exhausted body... All worth the wait!!! Can't wait for Chicago and Berlin!!! Oh Pleaseeeeeeeeeeeeeeee, I can´t wait to see the show at 23th Jully!!!! NY here we go!!!!!!! Bono, Edge, Adam and Larry; please make the live stream concerts. From your follower from the. thirty years. Great comments from Dave Fanning. Comments the band will respect and listen to. Here’s an excerpt from and email I sent to my family and friends on Friday – May 15th: First, buying your Christmas present in October for an event in the upcoming year is so well worth the wait. Yes, I drove to Vancouver BC yesterday to see U2 kick off their Innocence & Experience tour!!!!! And while they started forty-five minutes late it was worth it for they CLOWNED!!! I am not going to go into too much detail for I know some of you on this email plan to see them as well. However, I will say that they took us down memory lane and they also took us to church. I know that Bono stated that they released their album on iTunes for free out of panic of getting old and trying to increase their fan base. Well based on the crowd last night, I don't think they have to worry about that. Yes there were adolescents, teenagers, young adults and us old folks (yes, I’m calling myself old at age 45). And other than occasionally having to cover my nose (lots of marijuana being smoked) the atmosphere was great. However, there was one scary moment at the very end of the concert. As they exited the stage, The Edge fell off of the stage. He eventually got up and waved to the crowed; and we of course cheered him on. Again, as long as I am alive and able, I will continue to show my support for my favorite band!!! And yes, after seeing U2 kick off their 360 Tour in Chicago and now their I&E Tour in Vancouver, my new goal is to make all future opening nights.